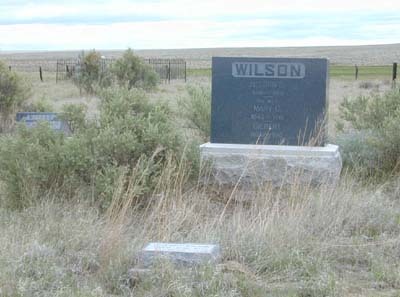 Wilson Cemetery is located in southern El Paso County. To reach it, take exit 122 from Interstate 25. Turn east, cross over the bridge and railroad tracks, and follow Old Pueblo Road north for about 1.5 miles. Turn southeast on Hanover Road and go about two miles. The cemetery is about 200 yards from the east side of the road inside a barbed wire fenced pasture. The cemetery is located between two buttes with a view of the Front Range of the Rocky Mountains. There are no trees and the cemetery is not maintained. According to GPS-derived geolocation (accurate to within 10 meters), the cemetery's coordinates are latitude 38°35'07.2"N and longitude 104°38'25.6"W.
It is not known why the graveyard is called Wilson Cemetery. At one time it was known as Butte Cemetery. One can only guess that the land was owned by the Wilson family when the first Wilson was buried there in 1910, but the first burial was that of Ida Robinson on October 15, 1864. Through ownership, the cemetery could have gone through several name changes. The cemetery was first extracted by Athlyn Luzier in 1971 and published in the Colorado Genealogist, volume 34, page 15. She lists additional family relationships not verified here. Permission to access the cemetery may be obtained by writing to Mr. and Mrs. Jon Frost, 17825 Hanover Road, Pueblo, CO 81008.